Welcome to the CoN page dedicated to Pulse. 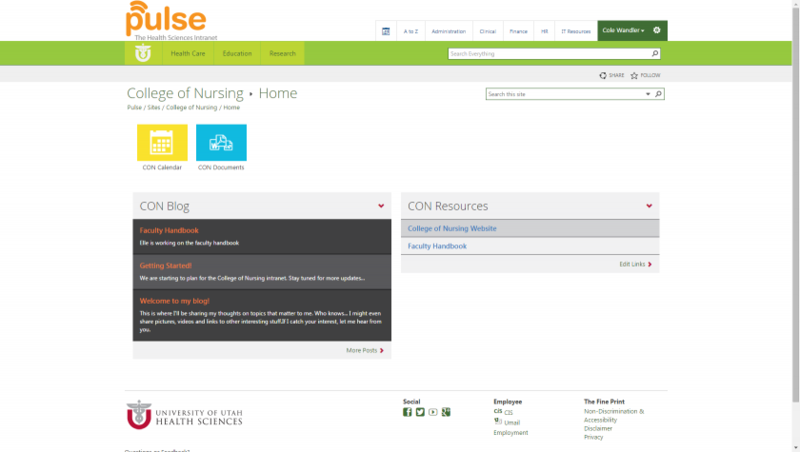 This page will contain many important tutorials for editing the CoN Pulse website, https://pulse.utah.edu/site/colnurse. 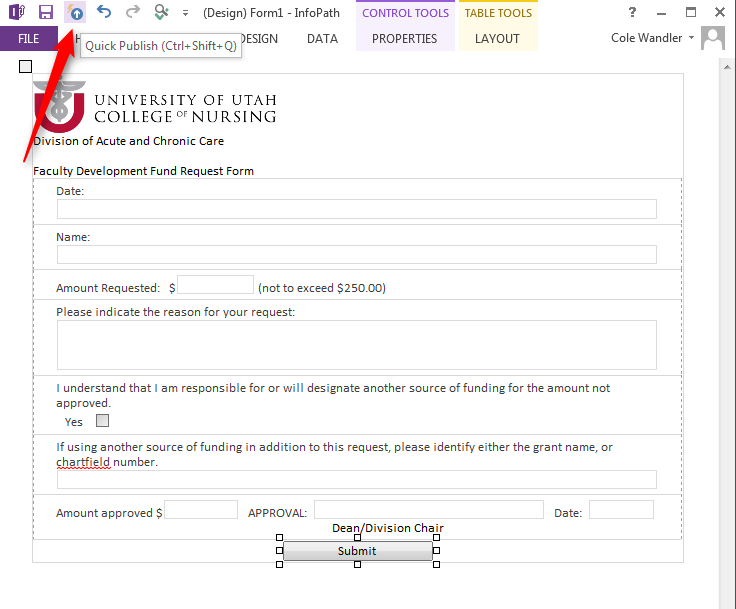 Before attempting to edit the CoN Pulse Page in any way, make sure to get the proper permissions for editing from Shaunelle Eckman (s.eckman@utah.edu). She is the main Pulse Content Specialist. This page may not cover how to do all the changes in Pulse you wish to make and you can also contact them for help on any Pulse topic not covered on this page. This short tutorial is for if you need to display any Office documents, pdf files, etc., and you need to store them on the CoN Pulse page. 2. Click on CON Documents. 3. 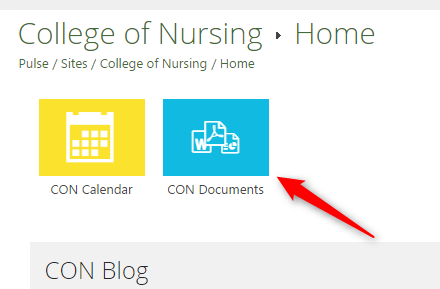 Simply drag and drop the file or document you wish to store into the CON Documents page. 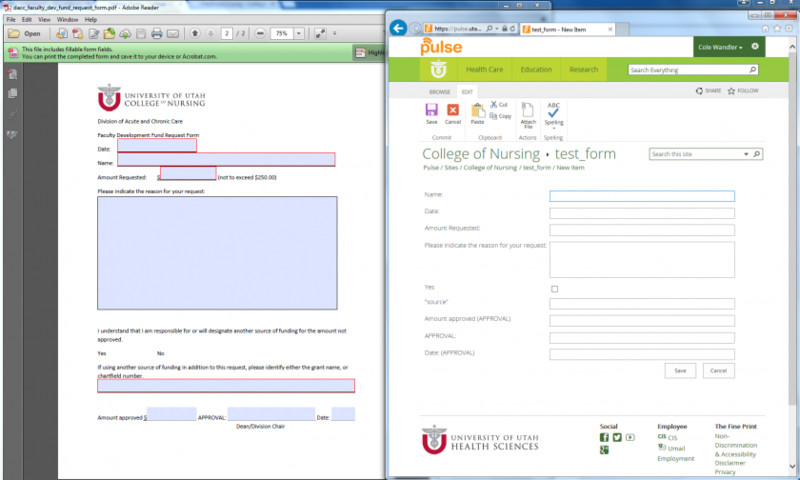 This lengthy tutorial will help you to create Forms in the CoN Pulse webpage. 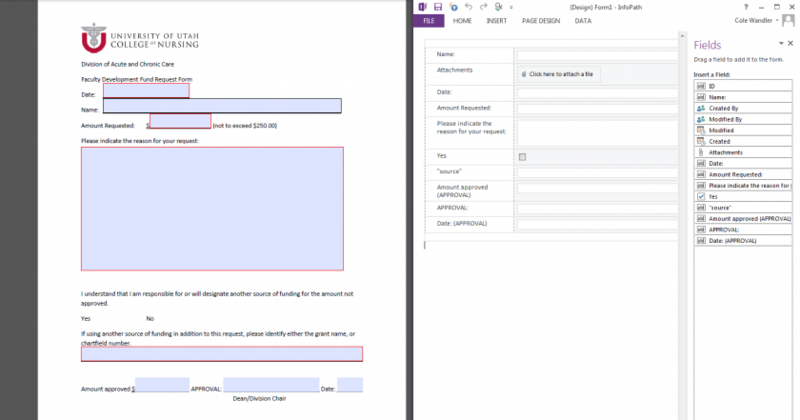 This section of this tutorial teaches you how to create a new form and the fields for that form. 2. 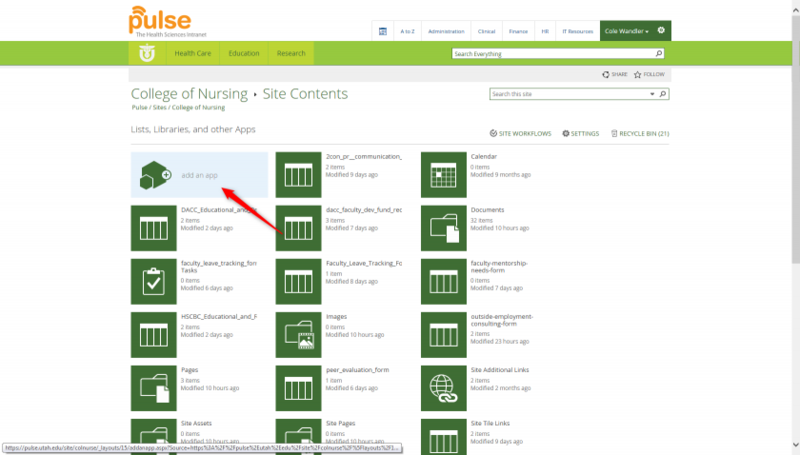 On the Site Contents page, click on Add An App. 5. 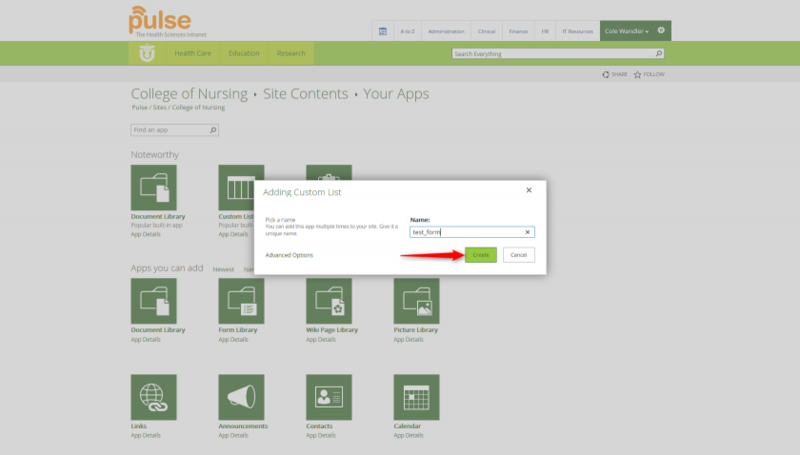 Choose the newly created form from Site Contents. 6. Click on List, then click on List Settings. 7. 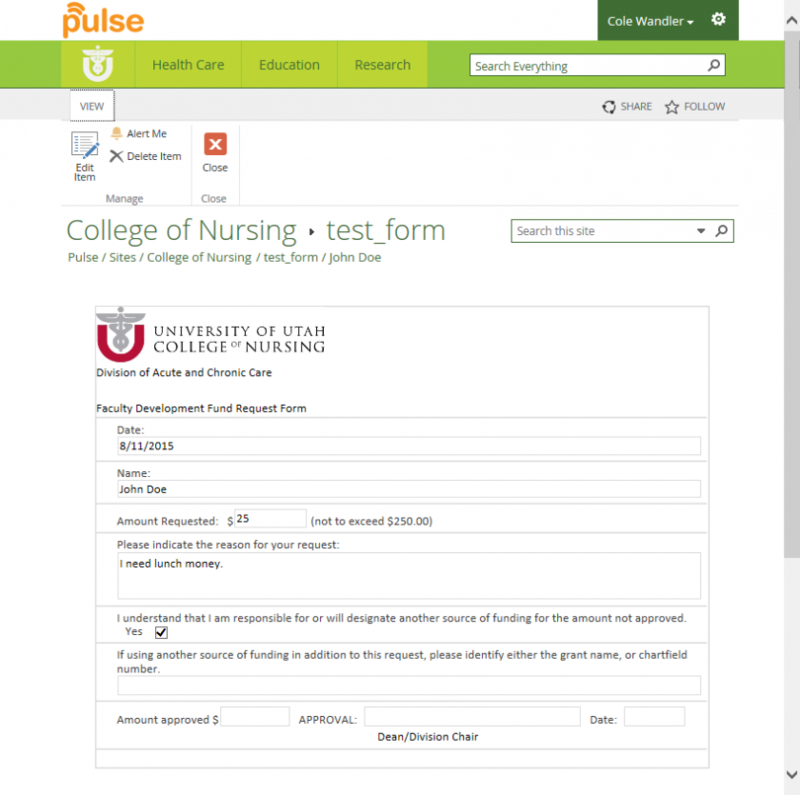 You will need to create the form's fields (any area where the user can enter data or make choices) in Pulse before you mold the form the way you want it to look. 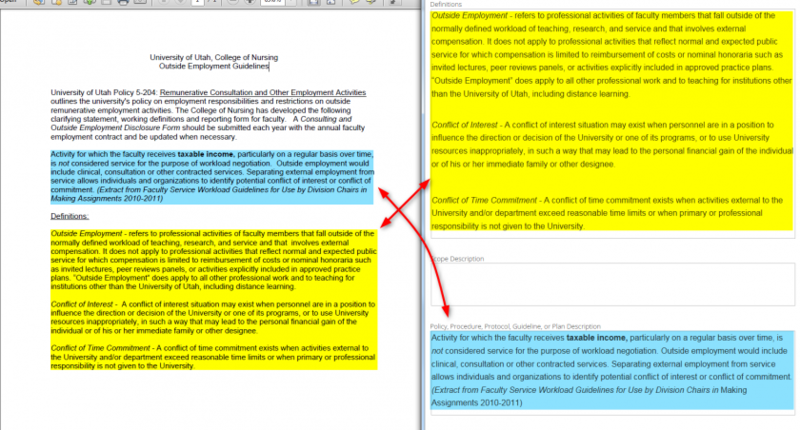 It is advisable to the at the source form (.pdf, website, etc.) and add all fields one at a time as they appear in the source form. That way, when we go to form the form, the fields will appear to be close to what they look like in the source form. 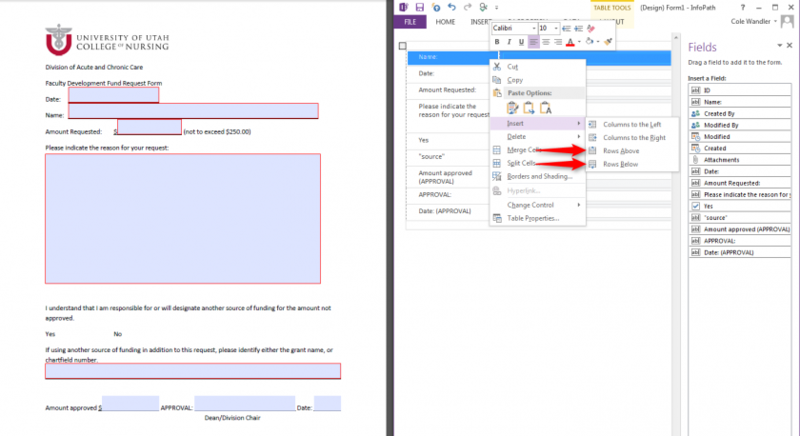 Click Create column to create a field. 8. We will add fields as they appear on the source form. The first field in this source form is a text box named Date so that is the name you will enter for the name of the field. Also, as it is a small text box, choose Single line of text. 9. The other notable option here is Add to default view. 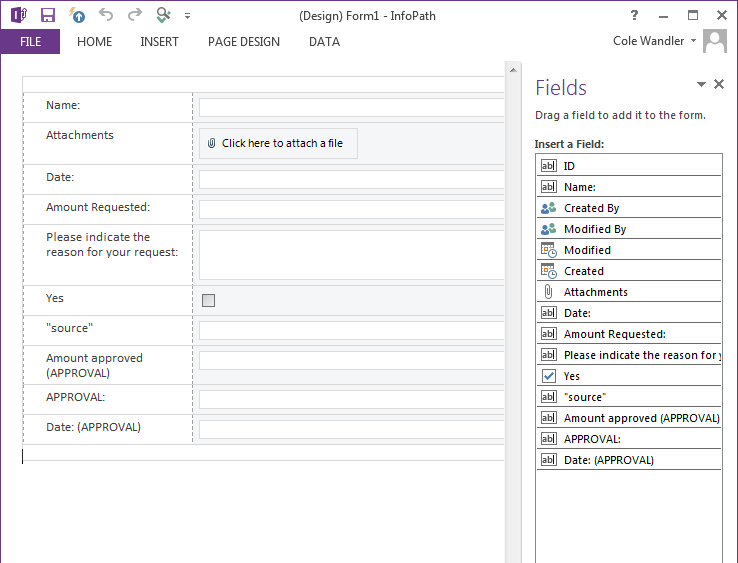 If this box is checked, it means all form created and submitted with show this field in the View screen. Unless you want people to be able to search for a form based on this field, click on this option to turn it off. 10. Repeat steps 7 - 10 to create all the other fields as the appear in form. This could include small text boxes, large text boxes, radio buttons, check boxes, etc. Note: whenever you create a new custom list, there is always a default field called Title. This field CANNOT be deleted. You can, however, change the name of this field. I recommend changing it to take the place of whatever your Name field in your source form is since this field must exist in the form. I also recommend setting the Require that this column contains information option to No unless you need it. 11. Once completed, you can view what the Pulse form looks like. 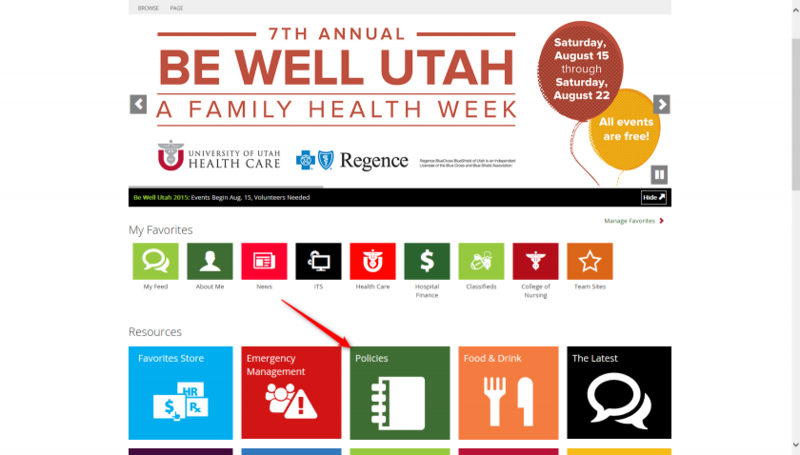 Click on the gear in the top right corner, then click on Site Contents (similar to Step 1). 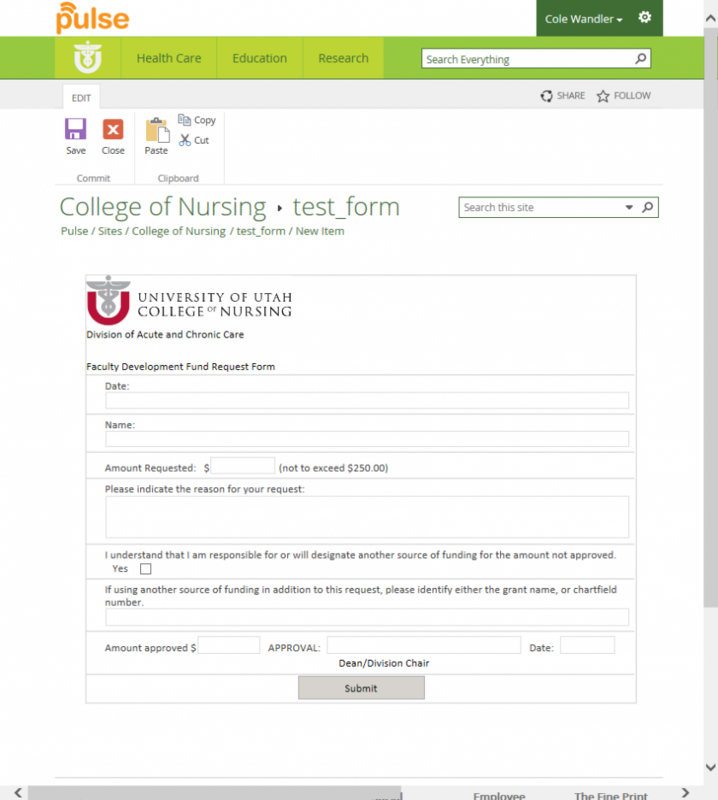 Then click on your form (similar to Step 5). 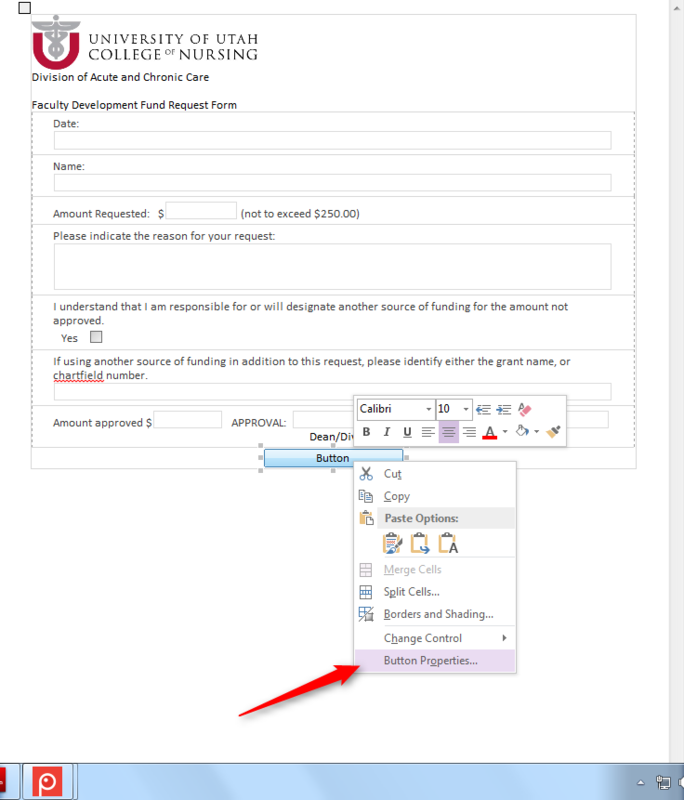 Then in the form, click on New (this creates a new form using your entered fields). Now you can see what the form looks like in Pulse, which is not at all how it looks in the source form. In the next part of this tutorial, we will look at how Infopath can be used to mold our form to the way we want it to look like. In this part of the tutorial, we will use Infopath to mold our form to look the way we want. 12. 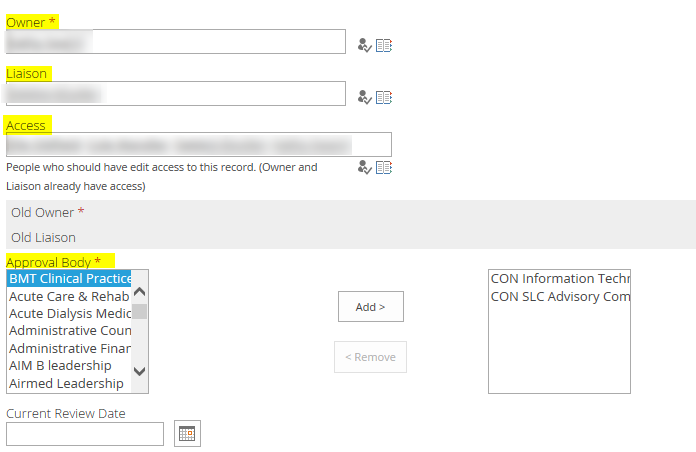 From the main form screen, click List, then Customize Form. 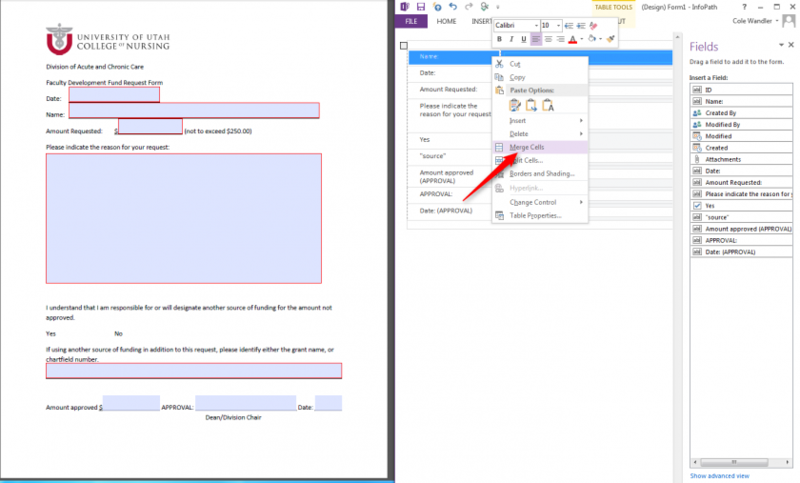 Notice the Attachments field. 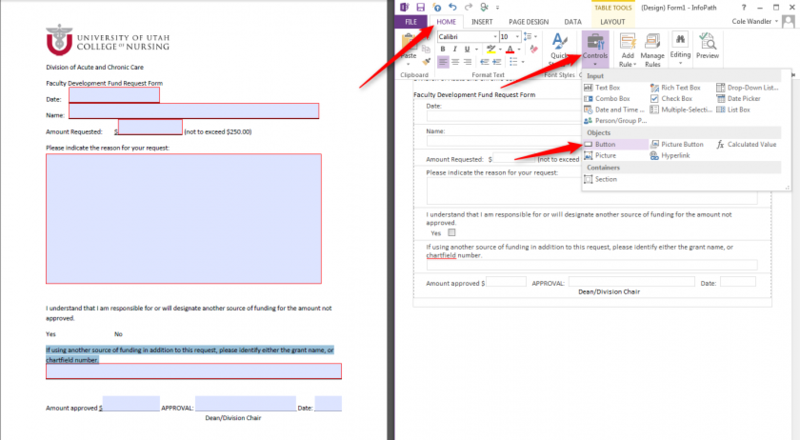 This field is always generated on every form but it CAN be deleted and it will not cause errors later. The Name field above that is the original Title field that we renamed before. You can move this Name field, but remember DO NOT DELETE THIS FIELD! 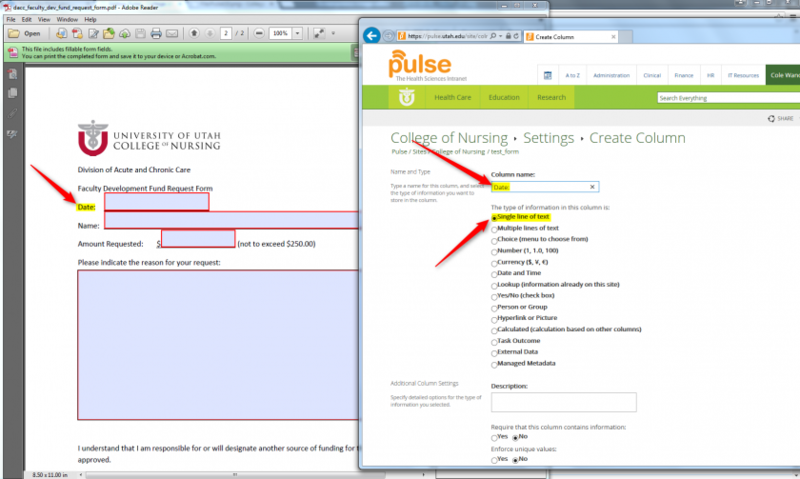 If you do, when you return to Pulse, when you try to submit a form you will get errors. 13. Work with your source form to change your form to look like it. 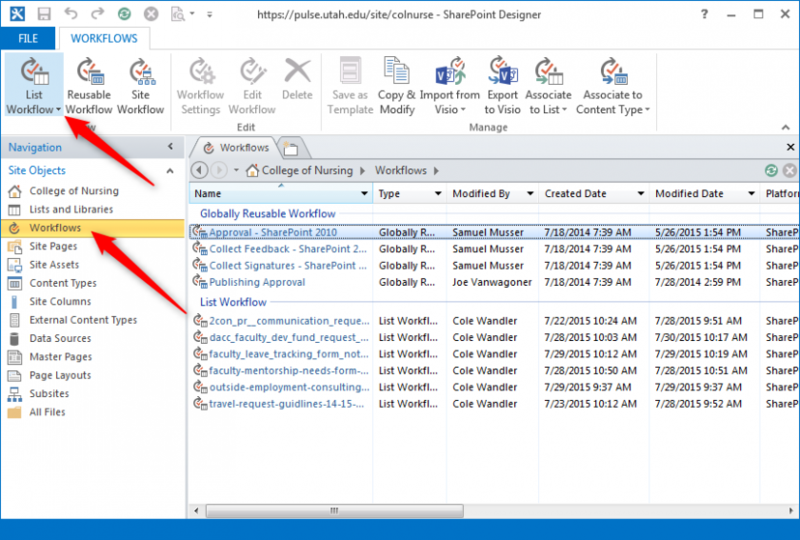 Infopath is easier to manipulate using Delete, Ctrl+C (Copy), Ctrl+V (Paste), etc. than using right click options. However, many times to get the cells to look the way you want, you will need to Right Click and use Merge Cells. Another right click tool you will use a lot is Insert -> Rows Above OR Insert -> Rows Below to add cells in Infopath. Be patient! Infopath is difficult to work with but with persistence, you can get it to do what you want. 14. 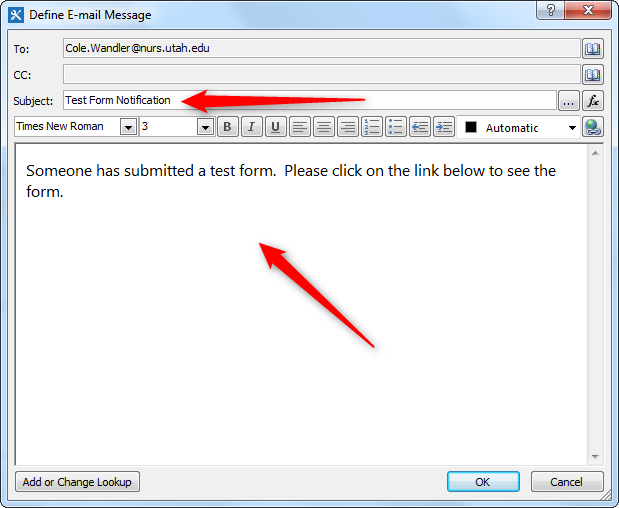 When you have finished molding the form the way you want, you will need to add a Submit button. 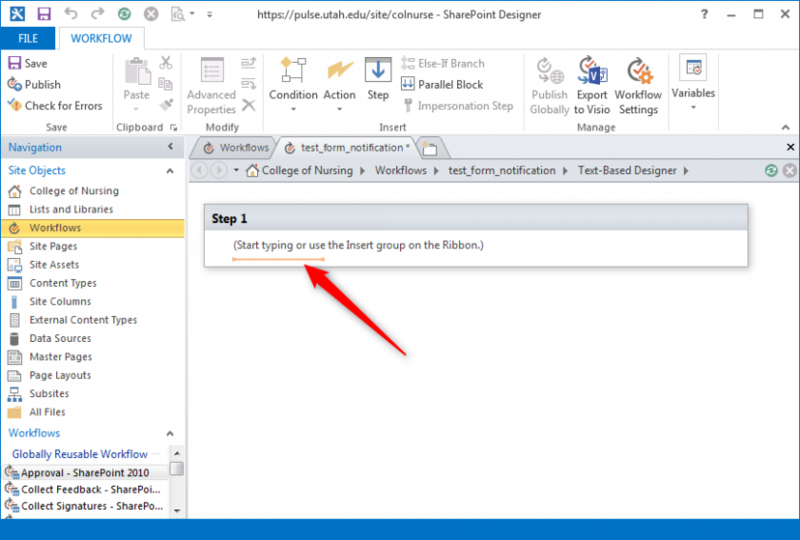 Position your cursor where you want the Sumbit button. Then click Home, the click Controls, then click Button. 15. 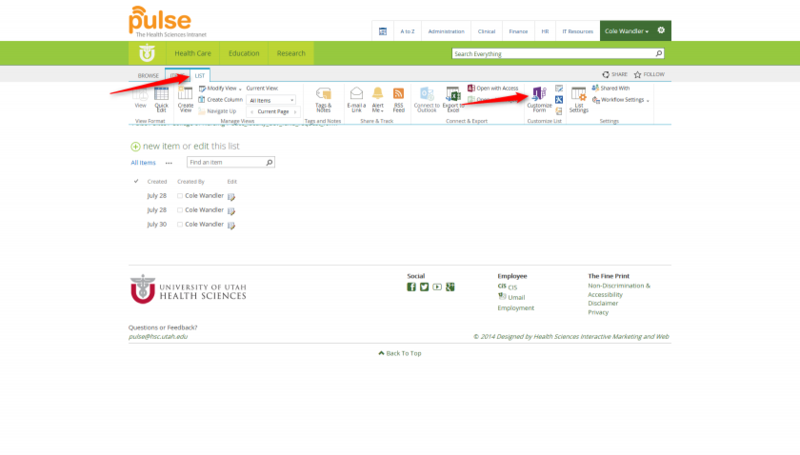 When you are completed with the form in Infopath, in the far left corner, click Quick Publish to save your form back to Pulse. 16. Now, if you click New in your Pulse form, you will see the Infopath form in Pulse. Important: If you need to add fields to your form, do it in Pulse and not in Infopath because if you do, you form will no longer work! 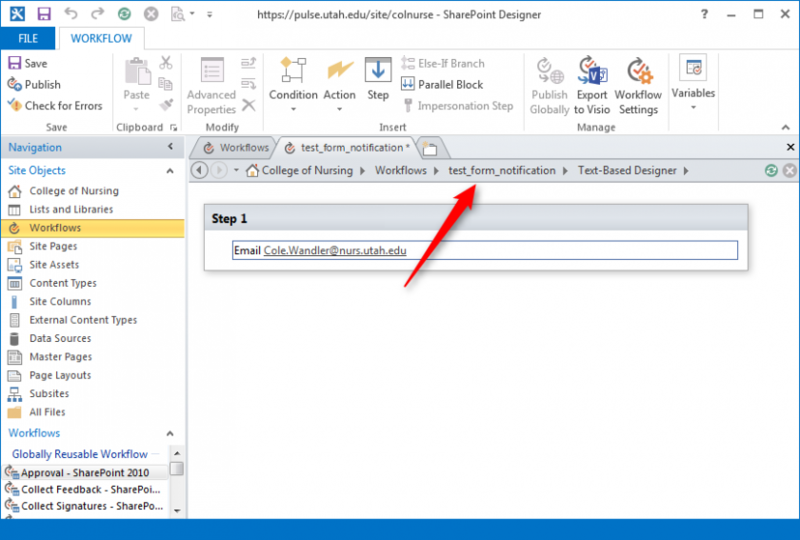 In the final part of this tutorial, we will use SharePoint Designer to add an option to send an email whenever anyone submits our form. 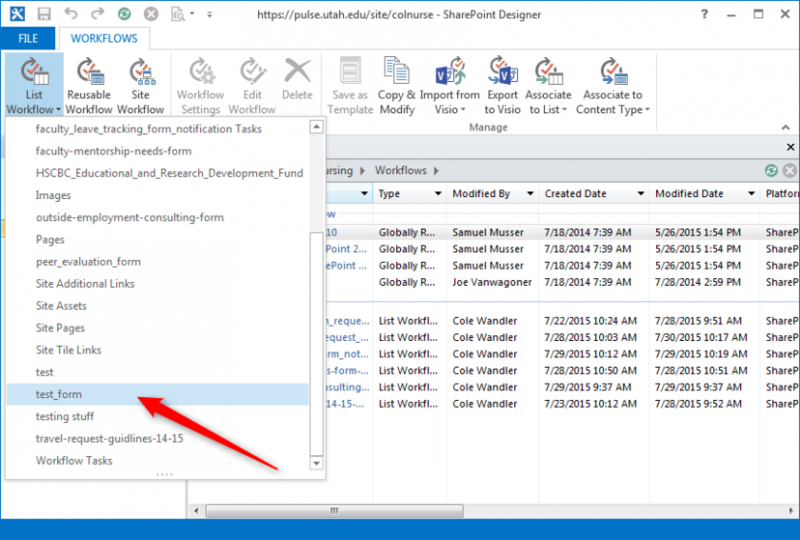 In this part of the tutorial, we will use SharePoint Designer to add email options whenever a user submits our form. 17. 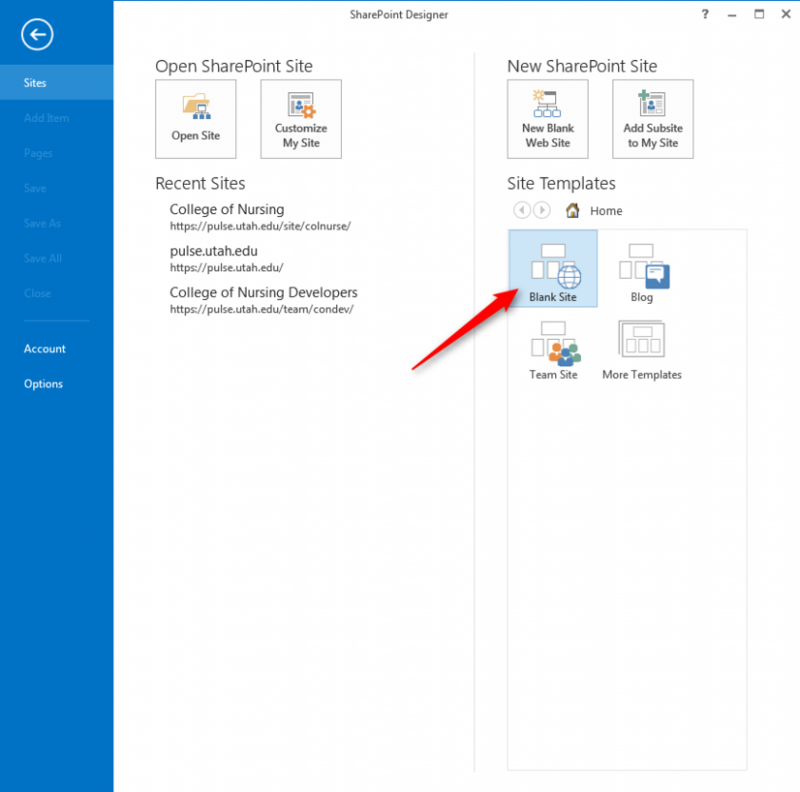 When you open SharePoint Designer, before get started, we need to connect to our website. Click on Blank Site. 18. For the website you enter, go to the CoN Pulse page, then copy that URL except for Pages/Home.aspx then click OK.
19. 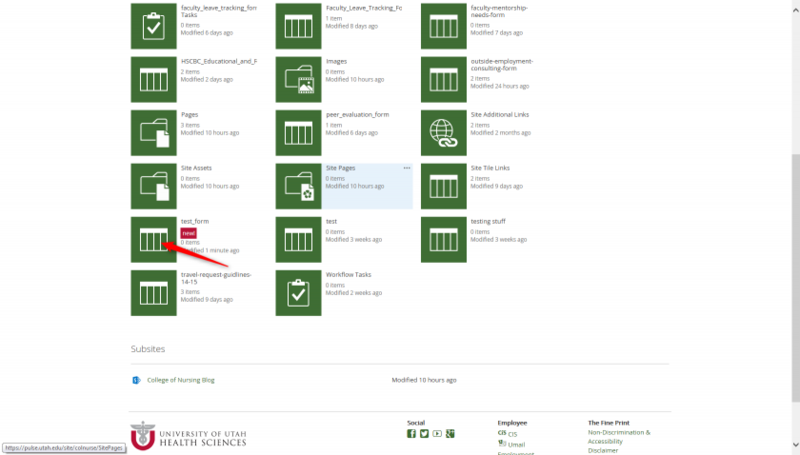 After you have connected to the CoN Pulse Page, click on Workflows, then click on List Workflow. 20. Look for the form you just created and click on it. 21. 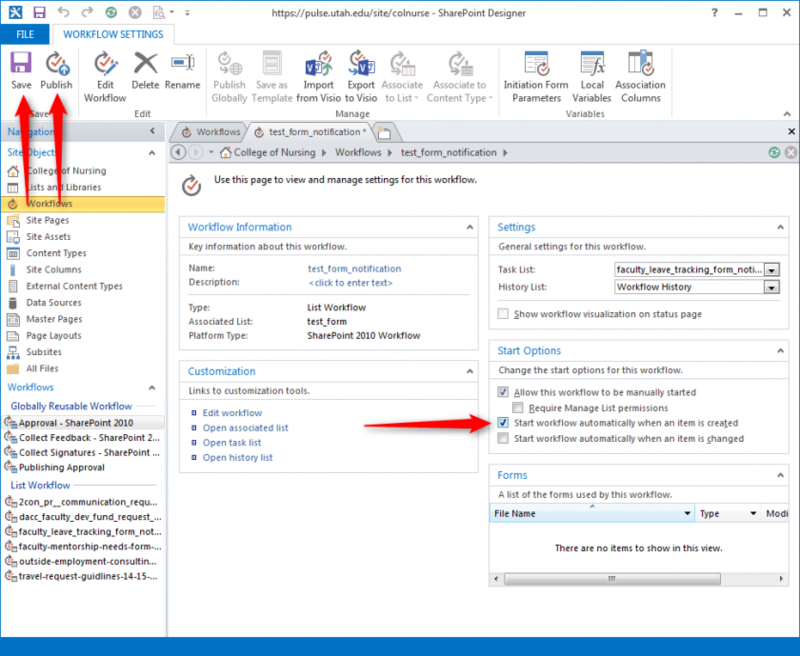 A Create List Workflow dialog box will appear. 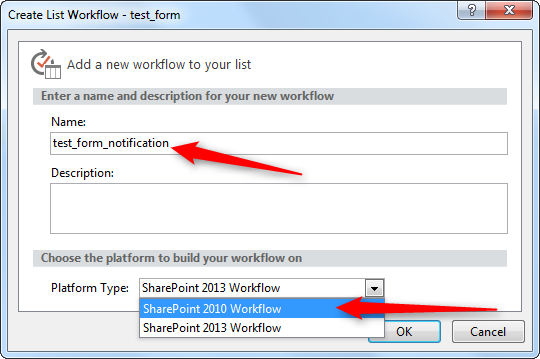 Type in the Name, description (optional), and then choose SharePoint 2010 Workflow (SharePoint 2013 Workflow will NOT work for the CoN Pulse page). 22. 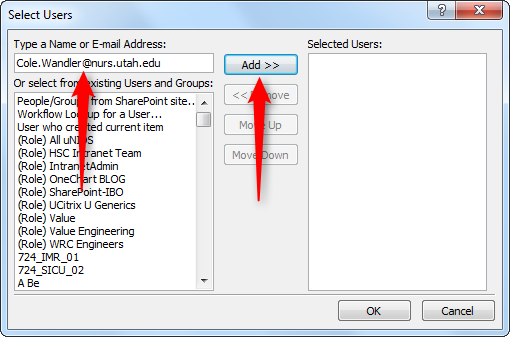 Type Email in the Step 1 area, press Enter, then click 'these users'. 23. 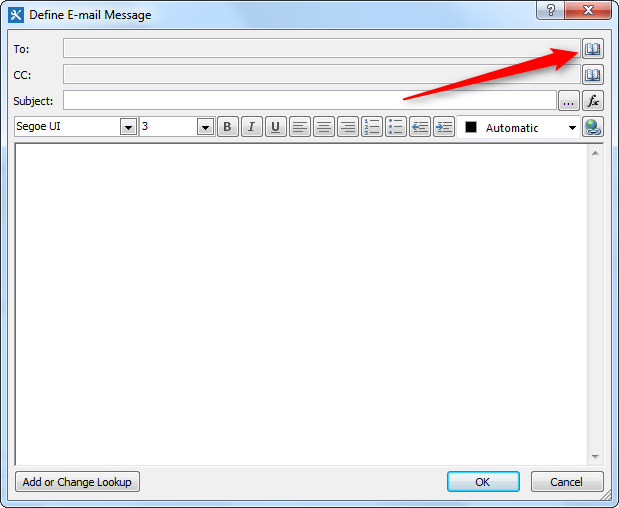 A Define E-mail Message dialog box will appear. First, click on the address book button to the right of the 'To:' textbox. 24. A Select Users dialog box will appear. You can either type in the email addresses you want or choose from the list. (Note: It is much easier to type in the email address than you try to use the list). Then click 'Add >>'. Repeat until you have added all the email addresses you want then click OK.
25. After you have added all the email addresses, type in your Subject and what you want your email to say once the form is submitted. 26. 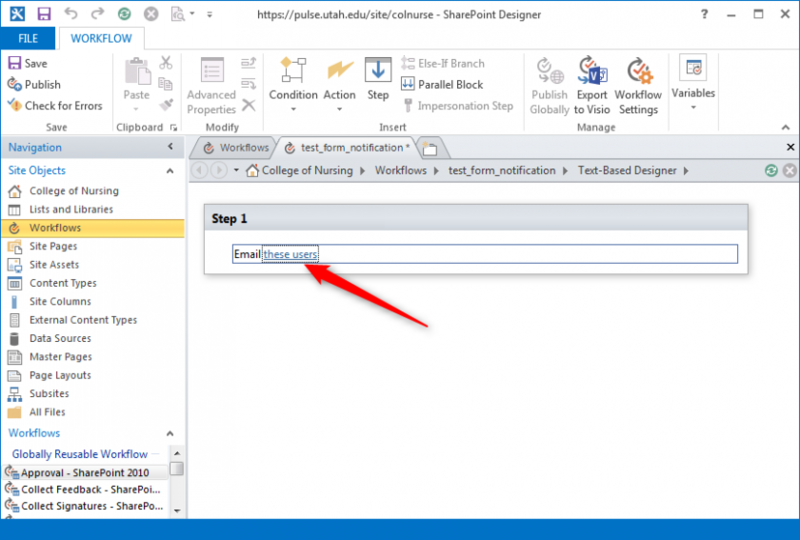 The next few steps with show you how to create web link to the form that was submitted by the user. 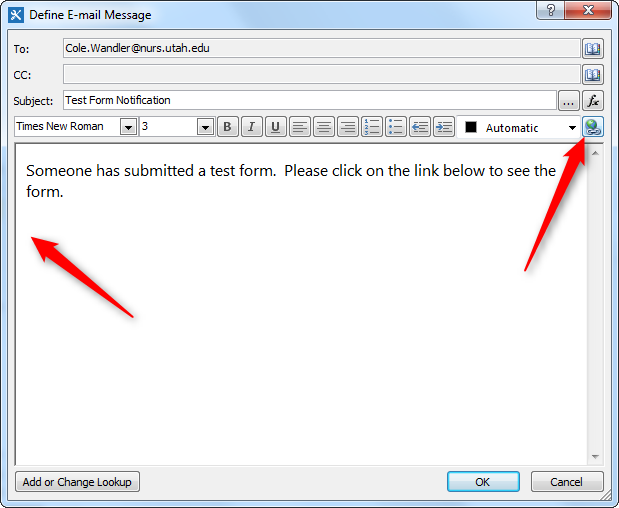 First, position your cursor where you want the link to appear in your email, then click the Hyperlink button. 27. 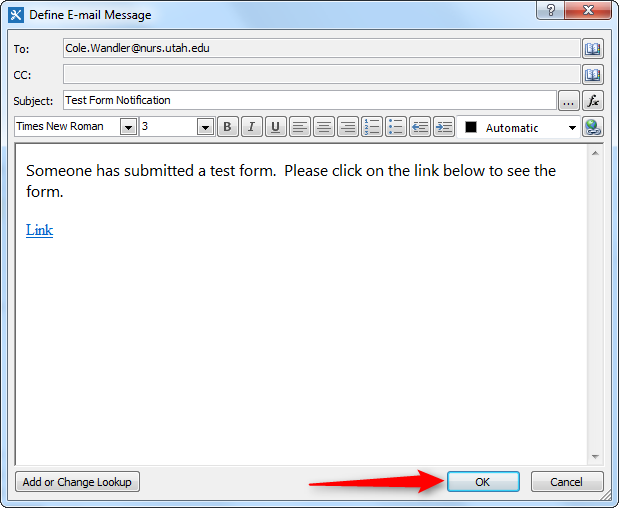 A Edit Hyperlink dialog box will appear. Type the label you want in the 'Text to display:' text box. 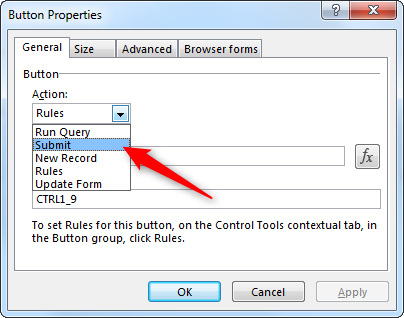 Then click the formula button to the right of the 'Address:' text box. 28. 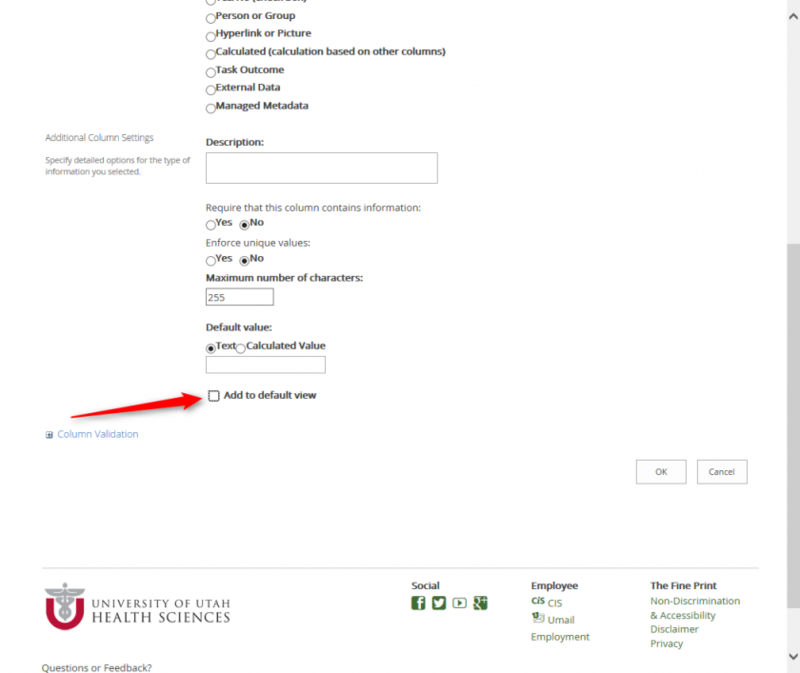 This step is critical for creating the link to the form submitted. A Lookup For String dialog box will appear. 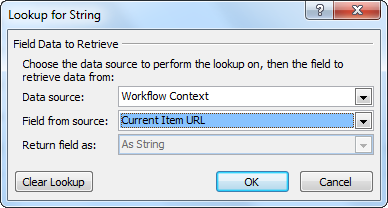 In the Data Source field, select 'Workflow Context' from the drop-down menu. In the Field from source field, select 'Current Item URL' from the drop-down menu. Then click OK.
29. If you choose the correct options, you should see [%Workflow Context:Current Item URL%] in the 'Address:' text box. If you do see this, click OK. If not, repeat steps 27 and 28. Now you should see the hyperlink appear in your email. Click OK.
30. We are almost done! First, we need to make sure that this email is sent to who we want when the form is submitted. Click on the name of the workflow we created. 31. These are the properties for the workflow we have created. Click on the 'Start workflow automatically when an item is created' check box. At this point, we should be ready to publish our workflow back to the CoN Pulse page. Click Save, then click Publish. 32. Now that our workflow has been published, we can test it. First, go back to our form, type in some random information and then click Submit. 33. Check your email for the auto-generated message we created in our workflow. If it does not appear, re-check steps 17-31 to check for errors. If it did appear, click on the link to make sure it works. 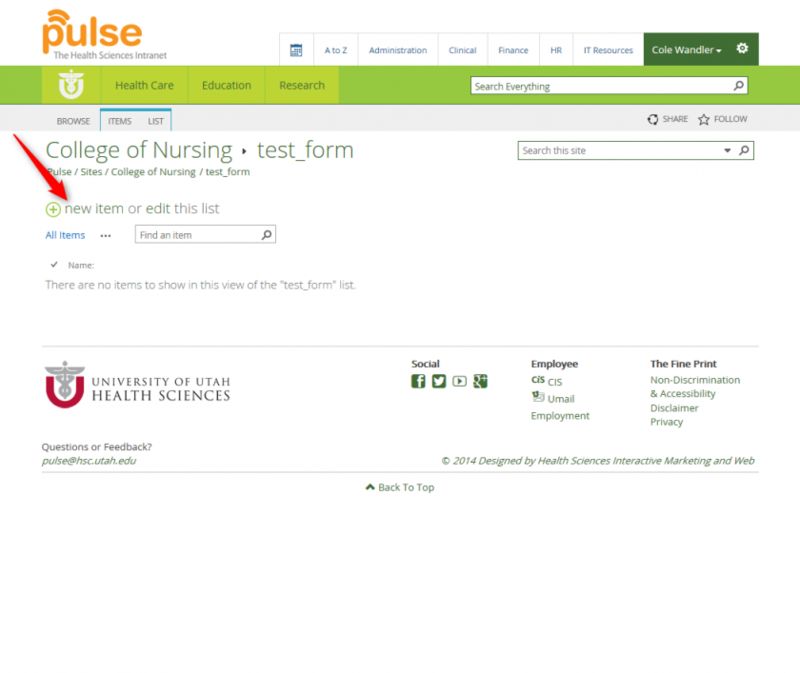 Congratulations on creating your first form (and adding a workflow) on Pulse! 1. 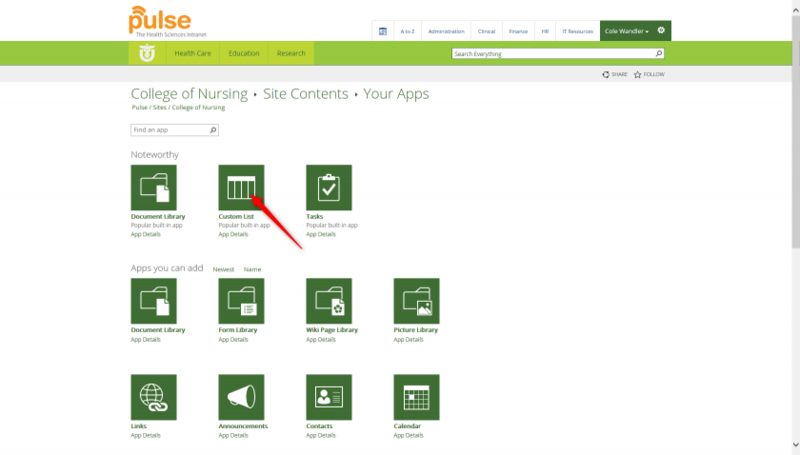 Go to the main Pulse page and click on Policies. 2. 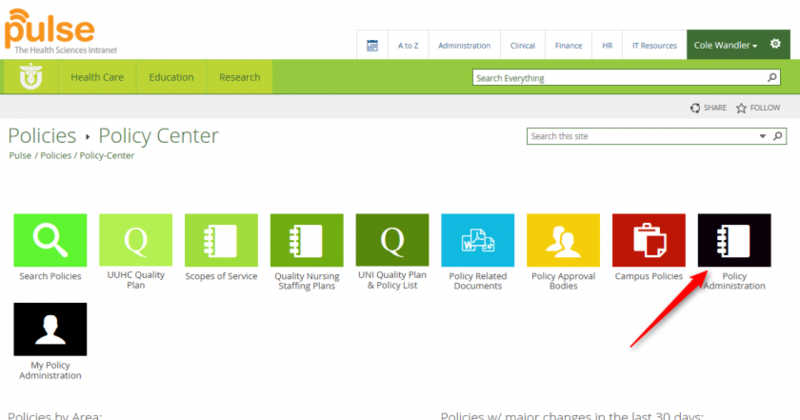 On the next screen, click on Policy Administration. 3. 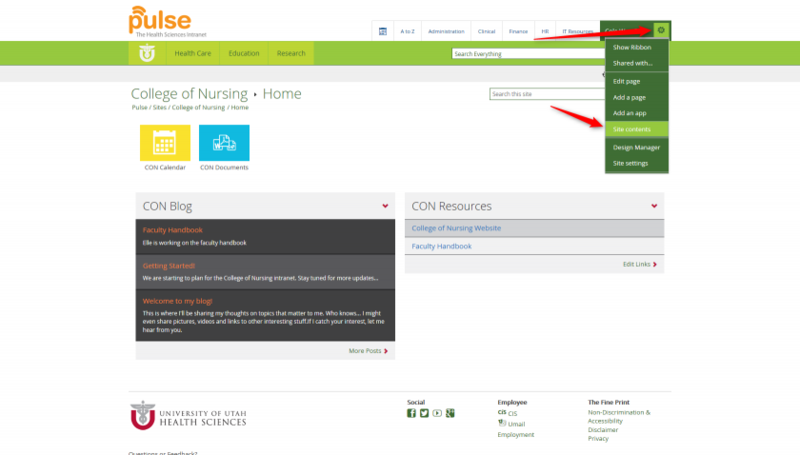 On the next screen, on the left hand side, you want to choose your department (In this example, we will use the College of Nursing). 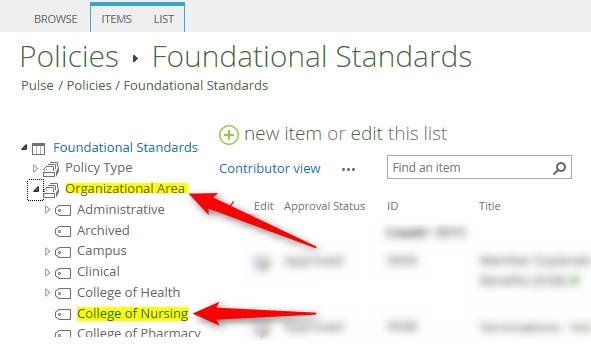 Click on Organizational Area, then click on your department. 4. 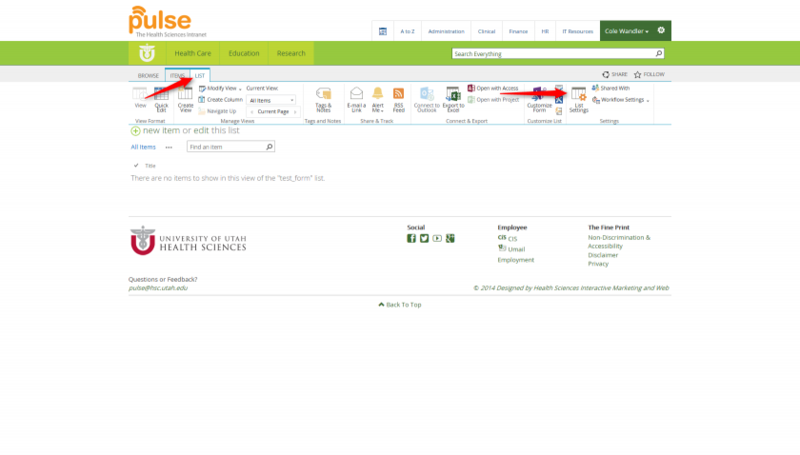 Once your department is chosen, click New. 5. Fill out the fields as you see fit. Note that the text editor that you must use is very hard to use but play around with it to get the hang of it. 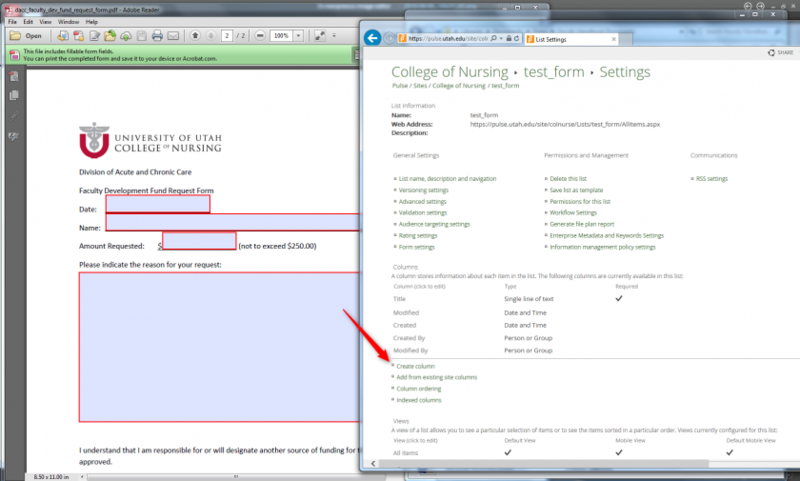 Here are a few pictures of an example policy to help you decide where to put information from your form. 6. 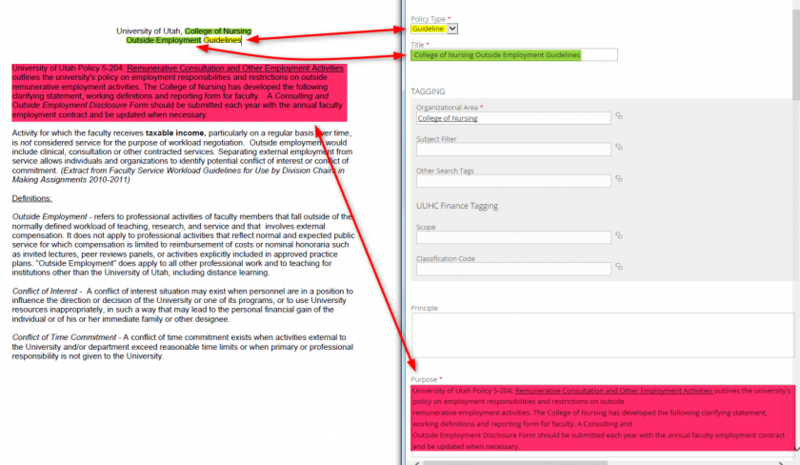 Finally, assign who you want to be the Owner, Liaison, and who has access to edit the policy. Also, decide who you want to to be the Approval Body for your policy. 7. Click Save at the bottom of the screen. On the next screen, you'll see a preview of your policy. 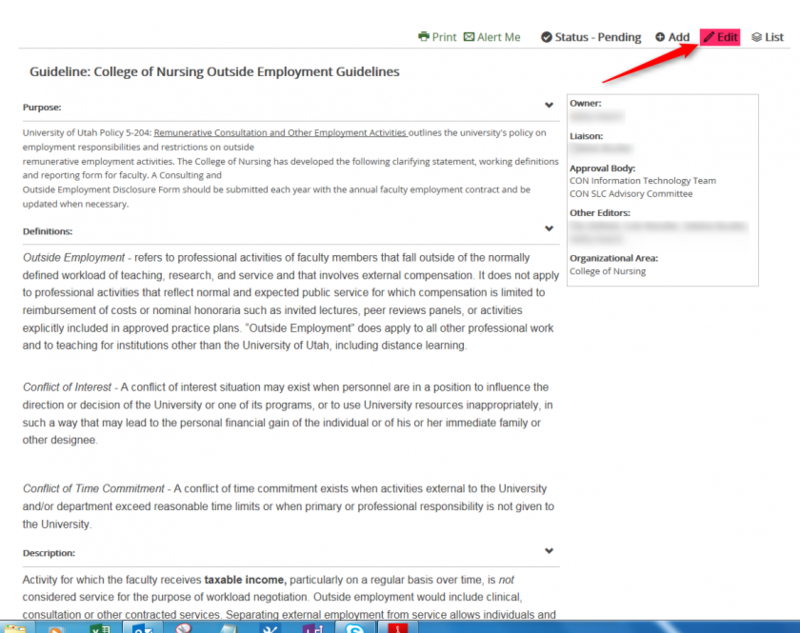 Also note if you wish to continue editing the policy, to click the Edit button. This page was last modified on 6 April 2016, at 09:27.